Yet another bankster has bitten the dust. Former National Bank of Commerce CEO James Stuart Jr. was found dead in Scottsdale, AZ. I know that these “suicided banksters” had a family and assumedly people in their lives who loved them. However, it is hard to muster up much more than crocodile tears when one realizes how much misery the bankster elite have mustered up in the service of their greed and power hungry ways. It becomes even more difficult to generate sympathy when one realizes that there is a global unanimity of concerted effort to murder people who are merely expressing their hopes, desires and concerns in a public forum. At the risk of sounding like Karl Marx, the super elite’s murdering of protesters clearly illustrates that what we used to consider to be the “legitimate” authority, is now clearly the enemy of the people. The super elite are clearly not serving the needs of the people, they are serving their selfish desires to help themselves to the resources of the people. And when the people object, they are being summarily executed in increasing numbers. 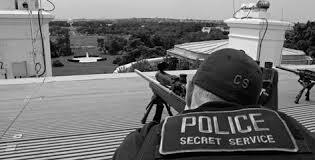 Just the sheer number of instances and the brutality in which freedom-loving people are being eliminated can speak to nothing else but this is a coordinated effort between and among the super elite on the planet to kill protestors by placing snipers on the roof. Photographed by journalists from Voice of Ukraine, we see pro-Russian forces firing upon unarmed protesters. 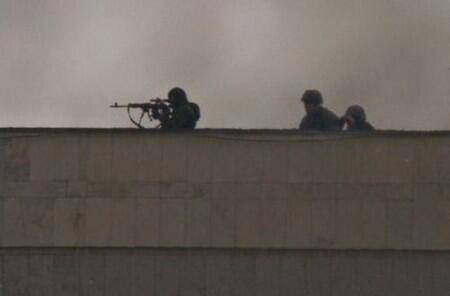 The pro-Yanukovich forces are pictured above on a rooftop of an Ukrainian house on January, 22, firing upon unarmed protesters. According to Ukrainian journalists, working for the Voice of Ukraine, this is very common occurrence in which untold numbers of protesters are being murdered on a daily basis. Here in Egypt, government forces are displaying their favorite tactic in dealing with an unhappy citizenry. The Syrian civil war is known for its extreme brutality and mindless oppression. 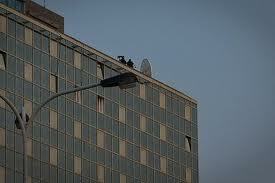 Here is footage of snipers on the roof, Syrian style, only this time, the sniper receives justice. News emanating from Venezuelan protesters is consistently revealing that government forces in Venezuela are summarily executing its citizens from motorcycles. Authorities are also breaking down doors of apartment buildings and murdering “suspected” protesters. As a result, protesters are being murdered by the Venezuelan government without trial. Some citizens, who are luckier than most are simply being arrested for “suspicion” of protest and hauled away without any due process of law. Recently, government opposition leader Leopoldo Lopez surrendered to governmental authorities. He is charged with inciting violence and opposition to the government. His arrest led to even more protesting. Venezuelan citizen, Gauber Venot, stated “It’s important we have foreign media here. Our media is censored; we learn about our own country from outside sources.” So is ours Mr. Venot, so is ours. Of course, this is Venezuela and this could never happen in America. Perhaps one might want to revise this consideration in light of recently released American military documents. I am hard pressed to make this comparison any more clear. The parallels speak clearly for themselves. 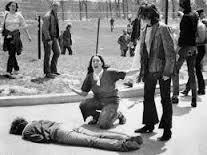 What will be the flash point where the “new” American policy in dealing with protesters will turn deadly? 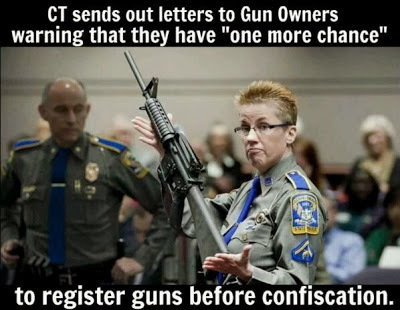 The above caption says it all.Today, tens of thousands of CT. residents are now felons. What will happen when American citizens, thinking they have the right to protest an unconstitutional law, march in the streets? If American authorities fire on protesters as the new detention camp documents claim they will, this can only end one way.